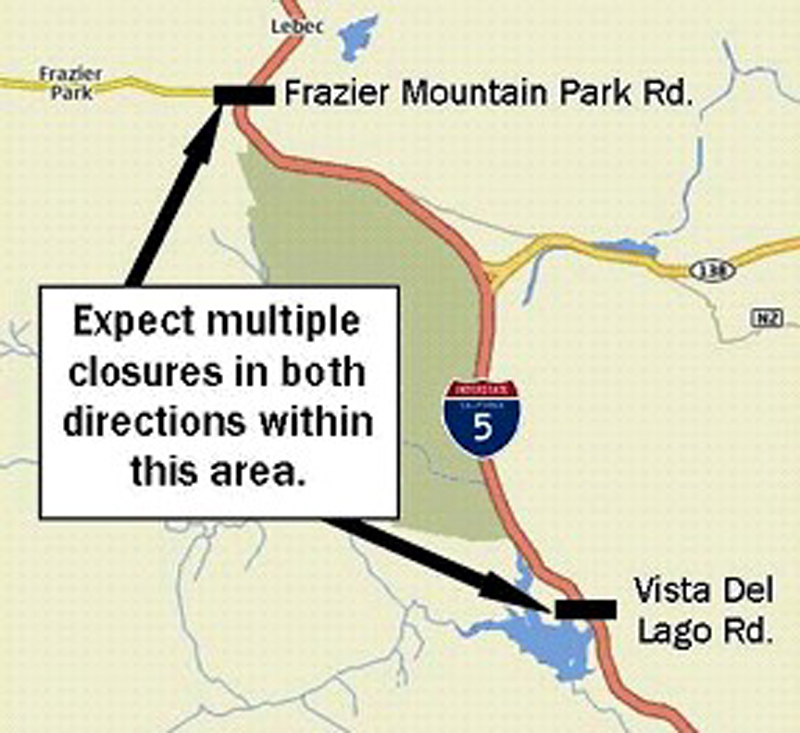 [Caltrans] – The California Department of Transportation plans to close multiple lanes of the Golden State Freeway (I-5) in north Los Angeles County as part of a $100.1 million pavement improvement project between Vista Del Lago Road and the Kern County line. Motorists should expect multiple simultaneous closures in different locations within the limits listed. Closures will be signed well in advance. Closure information for this and other freeway projects is available on the Caltrans website: http://www.lcswebreports.dot.ca.gov/lcswebreports. One lane: One lane may be closed at any time. The most restrictive closures (i.e., the most lanes closed) will happen between 10 p.m. and 7 a.m. when traffic volumes are lower. * Southbound I-5 between the Kern County line and Vista Del Lago Rd. This project will replace slabs in both directions of I-5 between the Vista Del Lago Road overcrossing and the Kern County Line, a distance of 15.4 miles. The two outside lanes and outside shoulder will be completely replaced, and damaged pavement slabs will be replaced in the inside lanes. Additionally, the project will update drainage features, upgrade the wooden guardrail posts to metal, add post mile signage, widen the inside shoulders, replace broken approach and departure slabs, and repave ramps. This $100.1 million project, which will be completed in mid-2015, will extend the life of the pavement, reduce maintenance costs and closures, and provide a smoother ride for motorists. The contractor is Griffith/Coffman Joint Venture of Brea, Calif. Most of the construction will be completed at night to minimize inconvenience to motorists, though there will be some work during the day.